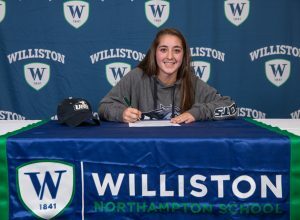 Senior Victoria Palumbo of Ayer, Massachusetts, agreed to play ice hockey and field hockey for the University of New Hampshire’s Division I programs. 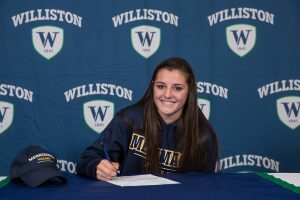 She signed a national letter of intent during a Nov. 10 ceremony recognizing seven Williston students signing to play college sports at the Division I and II levels. Tori plays midfield in field hockey and defense on the ice. She’s been on skates for 13 years, and involved in field hockey for six years. During her tenure at Williston, the teams she’s played for won the New England Championships in field hockey, and the Harrington Invitational Hockey Tournament in ice hockey. 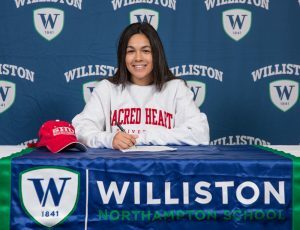 Delray Beach, Florida’s Shana Hecht agreed to play lacrosse for Fairfield, Connecticut-based Sacred Heart University’s Division I program. 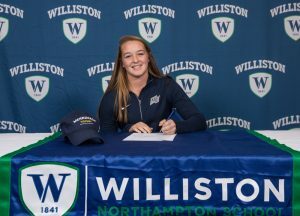 Shana signed a national letter of intent during a Nov. 10 ceremony recognizing seven Williston Northampton School students signing to play college sports at the Division I and II levels. She came to Williston as a junior, and has found the experience rewarding. “If I didn’t come to Williston I don’t think I would have had the opportunities I have encountered or be where I am today,” she said. 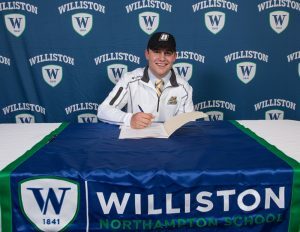 Westfield’s Mason Balch agreed to play lacrosse for Bryant University’s Division I program. 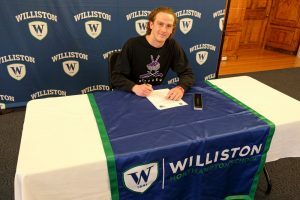 He signed a national letter of intent during a Nov. 10 ceremony recognizing seven Williston students signing to play college sports at the Division I and II levels. Mason plays attack. He’s handled a stick since kindergarten. His proudest moment on the field came last season, when he scored the game-winning goal in overtime against Canterbury to clinch the Western New England Secondary School Lacrosse Association Division II championship. Mason began his Williston career last year. “He genuinely has the tools to succeed at the Division I level, and we look forward to watching as he makes his splash at Bryant next year,” Dietrich said. Medfield’s Julia MacLean ’18 has agreed to play ice hockey for the Merrimack College’s Division I Warriors program. She signed a letter of intent during a Nov. 10 ceremony recognizing seven Williston students signing to play college sports at the Division I and II levels. It was on the ice at Lossone Rink at Williston that her dreams to play Division 1 hockey came true, she said. As she shifts to college, she said her goal is to be the best player, person, and student she can be. East Longmeadow’s Gabby Jones ’18 agreed to play ice hockey for Merrimack College’s Division I Warriors program. She signed a national letter of intent during a Nov. 10 ceremony recognizing seven Williston students signing to play college sports at the Division I and II levels. 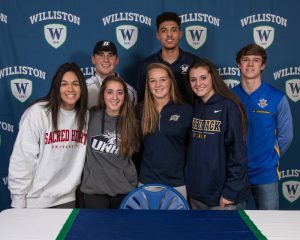 Years of dedication, perseverance, and gratitude led seven Williston seniors to the podium at the school’s Friday, Nov. 10, signing ceremony. For the sheer numbers as well as the enthusiasm of a room packed with parents, classmates, teammates, and coaches, the event embodied the communal Wildcat spirit. 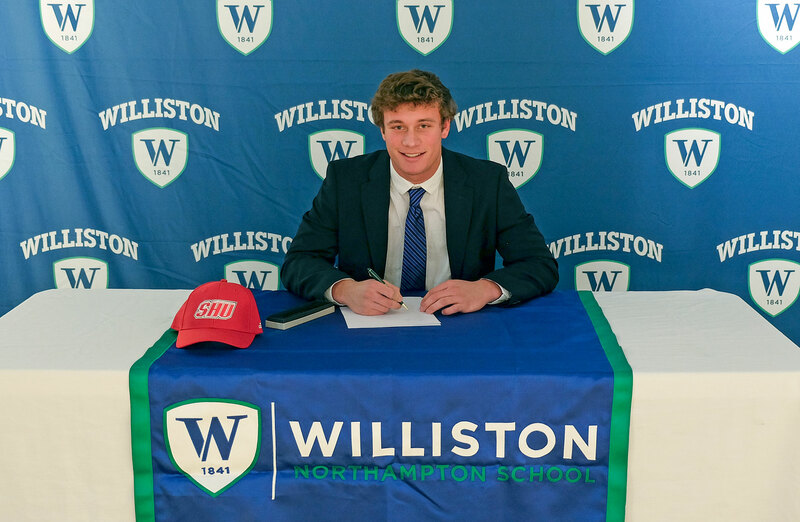 First to ink his commitment to Rollins College, in Winter Park, Florida, was Rob Champigny. Rob will play lacrosse for the Tars in the Division II Sunshine State Conference. JT Chamberlain’s dream has come true. And like any sought-after goal, his took a long time, a lot of early mornings, persistence, and patient, proud parents. 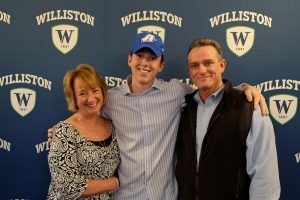 On Wednesday, April 12, JT formally committed to play hockey next year for the Greyhounds of Assumption College in Worcester, MA. JT, a Williston Northampton senior and forward for the Wildcats, has been anticipating this since around the time he could lace up his own skates. It takes three words for Coach Jacob Rivers to sum up Nate Balthazard, to accurately encapsulate the Williston Northampton football player’s guts, grit, and gridiron glory. However, for those who attended Nate’s February 6 signing ceremony, during which he formally committed to play football for Sacred Heart University in the fall, three words don’t tell the entire story. Duncan LeXander is headed home, or at least back to the region where he spent most of his life. But like most people who go back to where they’re from after being away, LeXander is returning a changed man, a scholar and athlete on a path to personal and professional success.